There are hundreds or thousands of magazines published every month around the world. So we need to be choosy to pick the right ones which are worth your money and most importantly the time you spend to read it. We have found that Reader’s Digest is a good choice to go for and it is available in many countries (having their own version). Almost every issue of the same is good balance of real life drama, inspirational stuff and it takes note of everyday heroes also. We mostly provide our Views and Reviews for India edition of the same. 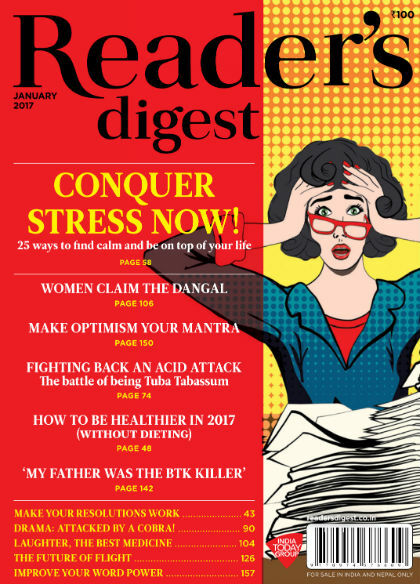 So here are our personal and unbiased views and reviews for Reader’s Digest (India)’s January 2017 issue. Over the period of time we have expressed our views and reviews for various issue of Reader’s Digest magazine by reading it’s print edition as well as Electronic edition. We have read some of it’s Electronic copies on Magzter app (You can read about Magzter – Online magazine store, and wether it is worth to go for here). This time we have read the Electronic version (E-Magazine) of January 2017 issue of RD at JioMags – available through Reliance Jio welcome offer – for free. So for this issue the value for money would be 100% for us in this context. The cover page have cheerful color combination. The contrast in which text is written is nicely readable. Otherwise we have seen many cases where good and cheerful colors fails in representing the textual content effectively. When we read any magazine issue, we never skip reading editorial. And we suggest all of the readers (most of them, we are sure, are not giving it a miss) to not to miss it. While reading Sanghamitra’s vision for this issue, what I like is her approach towards “stress”. She refers a Charlie Chaplin movie “Modern Times”. While welcoming a new year, we are going to have some more successes to conquer, achieve some more goals set for ourselves. But, we have to not to forget that life is living. If you are not enjoying what you are doing, it is have it’s own troll on you. Have you heard name of Temsutula Imsong? She work relentlessly towards making the society a clean place to live (yeah, literally). Her efforts are even acknowledge by Mr. Narendra Modi, Prime Minister of India. She is definitely the real life hero. She deserves appreciation and her entire team too. Another worth reading (small) article in the magazine is about an incident happened in New York. Ms. Lockwood, an English Teacher asked her student to write to their favorite author and convince him/her to visit their school! The students wrote a letter to Kurt Vonnegut (official website: http://www.vonnegut.com/) and they got a response too! Reading about it feels my heart of pure joy. What a thought Ms. Lockwood presented and how fantastically students grabbed it. And the response from Mr. Vonnegut is also worth appreciation. Those students are going to consider the society a really “worth living” place for sure. Provide your opinion about – Temple entry case – is a thought provoking segment. In terms of human, we all are equal and share equal rights (and should be granted the same, in democracy especially). What is your opinion about it? This segment talks about the resolutions we take in the beginning of every new year. The most important thing is live them actually. If we are unable to keep them, they are meaningless. And we all know that. The article tries to show the ways to how to keep them. And that is something worth reading for sure. A similar small article titled “6 ways to be healthier in 2017 (without dieting)” is also a good read. If you are interested in reading about “manners and etiquette at workplace”, there is an article on page #52, which you should not give a miss. It is about stress. The article is on page # 58. It mentions 25 things about stress, which one should know. There is a nice illustration showing you the changes happened in you body when you are under pressure. And then it talks about various formulas available to determine the stress level or it’s symptoms and much more. Today when we see that majority of people are caged in the rat-race willingly or unwillingly to pursue their dreams and sometimes illusions; it is worth to take a pause and go through such nicely written articles. Against the odds by Chris Turner is another real life story which is worth reading. It is inspirational and written nicely too. Another real life story is there about Tuba Tabassum. It is actually a shameful incident happened to her. She became victim of acid attack. She is still in the mental shock of what happened to her. The detailed article makes you think, are we living in a civilized society? Also how the accused are tying to prove their age and get advantage of juvenile act is quite alarming too. The article needs to be read. The real life drama – attacked by a cobra – is spine chilling. This article is about Geeta and Babita Phogat whose names are now famous with the success of Hindi movie Dangal. Mahavir Singh Phogat’s journey in wrestling and training his own daughters for the same and making them able to get the first gold in women’s category for Indian in wrestling is definitely inspirational. There is a book named “Akhada” is written which is official autobiographical stuff of Mr. Phogat. There are humour and laughter segments which you will enjoy for sure, mainly if you like intelligent takes and satirical stuff. A magazine having worth to read content for sure. Magazine price is Rs. 100, so it may seem a little high to some readers. But, the content justifies it. And, now you know how you can read it if you are exploring the welcome offer of Reliance Jio. If you want to read quality stuff, January 2017 issue of RD India is definitely a good choice to go for. Have you already read this issue? What you think about it? Do let us know your views about this article via comments below, we like to read you. And yes, do not forget to share this article with your friends over various social networks via Twitter, Facebook, Google Plus and others. And yes, you may like to subscribe to our RSS feeds and follow us on various Social networks to get latest updates for the site to land right in your mail box.